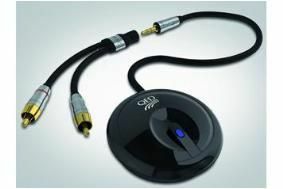 CES 2010: QED uPlay sets your digital music free | What Hi-Fi? The QED uPlay is a Bluetooth 'puck' designed to stream music wirelessly from any Bluetooth-equipped portable device to your main hi-fi or AV system. It can also be connected to iPod docks with an aux in socket. The uPlay Bluetooth receiver incorporates the apt-X Codec as well as the latest Bluecore 5 chipset. Bob Abraham, QED founder, says: "Increasingly more and more people are using their iPhone or laptop as a Personal Entertainment Device (PED). The combination of stored music, videos and games, together with a plethora of streamed content from the internet, especially free music services, has transformed the way people access media." Abrahams says Bluetooth is the ideal way to ‘liberate' this often protected content and wirelessly deliver a very high quality music stream to your sound system. "Now, thanks to apt-X, you can enjoy wireless, streamed music with CD quality sound," he says. QED uPlay seamlessly switches between the standard SBC Codec and apt-X, depending on the transmission source. It will be available in March, price to be confirmed.